One in five Americans has a mental illness. 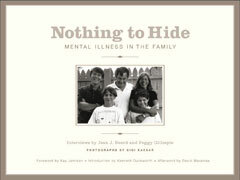 Nothing to Hide, a stunning tribute to the millions of families for whom mental illness is a part of everyday life, juxtaposes first-person accounts with beautifully reproduced duotone photographs of forty-four families who defy the stigma of mental illness to speak for themselves about their lives, their illnesses, and their struggles to get well. Each family in the book is portrayed in two ways: Photographs capture the members together and, often, singly or in pairs. Individual statements—usually one from each person in the family—complete the family picture by telling the story from various points of view. The families, different in many ways, have in common an ongoing struggle with illnesses ranging from schizophrenia and bipolar illness to obsessive compulsive disorder and major depression. These open and candid stories show us that the mentally ill and their families have much in common with the rest of us. They can be found in every community of America, and represent the full range of our economic, racial, and ethnic diversity. Only a small percentage of the mentally ill live with caretakers or in treatment centers. In her foreword, MacArthur Award–winning author and psychologist Kay R. Jamison calculates the enormous costs of stigmatizing the mentally ill. And an introduction by Kenneth Duckworth, medical director for the Massachusetts Department of Mental Health, details our current understanding of mental illness. The book concludes with a moving personal essay by Pulitzer Prize–winning Washington Post journalist David Maraniss. Jean J. Beard, a licensed clinical social worker, lives in Amherst, Massachusetts. Peggy Gillespie is a co-founder/director of Family Diversity Projects in Amherst, Massachusetts.